This updates the previous clinical update of 21 Feb 2013. In Africa, 34 countries are considered at risk of yellow fever (YF) . In February 2013, NaTHNaC [National Travel Health Network and Centre] reported on confirmed cases in Chad, Cote d’Ivoire, Democratic Republic of Congo, Nigeria, Republic of Congo, Sudan, and Togo . Since then, in March 2013, cases of yellow fever have also been reported from Niger and Ethiopia. As of 15 Apr 2013, a yellow fever case has been confirmed in Diffa district, Niger. A mass-vaccination campaign has not been conducted in the district, however, an extensive epidemiological investigation is ongoing together with active case searching to identify additional suspected cases . As of 7 May 2013, 6 confirmed cases of yellow fever have been reported from South Omo, in the Southern Nations, Nationalities and Peoples’ region in Ethiopia. The Ministry of Health in Ethiopia is launching an emergency mass-vaccination campaign on 10 Jun 2013 in 6 districts: Benatsemay, Gnangatom, Hammer, North Ari, Selamago, South Ari, and one administrative town (Jinka) in the South Omo Zone of the Southern Nations . Under International Health Regulations (2005) countries are no longer required to automatically report YF outbreaks to WHO . Surveillance and reporting in YF risk countries can be poor. When undertaking YF risk assessment, health professionals should refer to individual country information where details relating to YF disease risk areas and recommendations for YF vaccination are given. In addition, health professionals are encouraged to access the NaTHNaC Outbreak Surveillance Database where verified and unverified outbreaks of YF are posted, as well as newly published guidance on the recommendations for the use of yellow fever vaccination booster dose. YF is transmitted to non-human primates or humans via the bite of an infected mosquito. In Africa, the virus is transmitted via the bite of _Aedes_ spp. mosquitoes that feed predominantly during daylight hours. Travellers should take mosquito bite avoidance measures and seek advice regarding YF vaccination before travelling to YF risk areas. YF vaccination is recommended for personal protection for all travellers aged 9 months and older to countries with a risk of YF. Full details of YF vaccination recommendations can be found on the NaTHNaC’s Country Information Pages. Details of the countries that require proof of YF vaccination as a condition of entry (under the International Health Regulations (2005) are also provided. 1. World Health Organization. 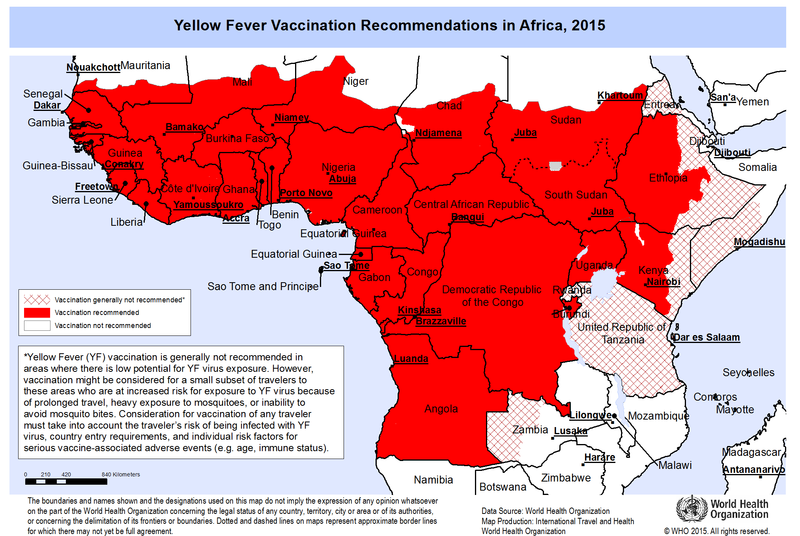 Yellow Fever Vaccination Recommendations in Africa, 2011. [Accessed 4 Jun 2013]; available athttp://gamapserver.who.int/mapLibrary/Files/Maps/ITH_YF_vaccination_africa.png. 2. National Travel Health Network and Centre. Clinical Update: Yellow fever activity in Chad, Cote d’Ivoire, Nigeria. 21 February 2013. [Accessed 4 Jun 2013]; available at http://www.nathnac.org/pro/clinical_updates/yf_africa210213.htm. 3. World Health Organization. Regional Office for Africa. Epidemic & Pandemic alert and Response (EPR). Outbreak Bulletin 26 Apr 2013; 3(3). [Accessed 4 Jun 2013]; available at http://www.afro.who.int/en/clusters-a-programmes/dpc/epidemic-a-pandemic-alert-and-response/outbreak-news/3834-outbreak-bulletin-vol-3-issue-3-26-april-2013.html. 4. World Health Organization. Yellow fever in Ethiopia. 31 May 2013. [Accessed 4 Jun 2013]; available athttp://www.who.int/csr/don/2013_05_31/en/index.html. 5. World Health Organization. International Health Regulations. About the IHR. 2013. [Accessed 4 Jun 2013]; available athttp://www.who.int/ihr/about/en/. I am going to visit Mali on 29 june I called your Noida clinic but its not available there I request you to kindly arrange the same .